An early goal from Tommy Coyne was enough for Linlithgow Rose to overcome Crossgates Primrose in the first round of the Fife & Lothians Cup. In match which saw the home side finish with nine men, the opening was fairly even. It wasn’t until the 13th minute that the Rose threatened with a free kick at the edge of the box following a foul by full back Wilkie on Owen Ronald. However, Ronald drove the kick into the wall and then did the same from the rebound and the danger was cleared. But Rose were back on the attack a minute later and when Ronald chested the ball down, Coyne hit a lovely dipping volley into the bottom corner past the helpless Manderson to put the Rose ahead. A Ronald volley went straight at the keeper but on the half hour the home side came close to an equaliser. Wilkie sent in an inswinging corner from the right and Hughes sent in a powerful header which beat Darren Hill but hit the underside of the bar and the Rose keeper was able to grab the ball on the line. 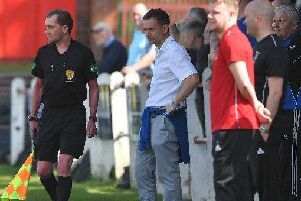 Immediately Aiden Malone came close with an overhead kick after good work by Coyne and Ronald before Crossgates suffered a major blow when centre half Andrew McDonald was late and high with a lunge on Turnbull and referee Lorraine Watson sent him off. The Rose were finding it difficult to make their extra man count as the home side continued to defend well and ten minutes into the second half when Ronald looked certain to score after good work by Blair Batchelor and Cammy McClair, Wilkie made an outstanding block to divert the ball for a corner. Just after the hour mark the Rose missed two chances in quick succession to clinch the match. Malone shot wide after being put through by Batchelor and then Batchelor himself shot off the keeper’s legs after a fine through pass from McClair. After Manderson made a magnificent one handed save to keep out Batchelor’s header, the home side were reduced to nine men. Pearson and Ruari Maclennan went into a full blooded challenge on halfway and the ball shot out of the park for a throw in, however the home man then threw the Rose player to the ground and he was immediately shown a straight red card. MacLennan was booked for his part in the incident. With ten minutes to go Coyne’s free kick crashed back off the bar and the game drifted to a close. Crossgates took the plaudits for some excellent defending despite their numerical disadvantage - for the Rose this was a disappointing 90 minutes but at the end of the day they are through to meet Pumpherston in the next round.